These great Christmas events and activities will help make the season even more magical! On 6 December the annual Christmas Fair will take place in various venues, creating the opportunity for more people to enjoy the festive atmosphere, while Crickhowell businesses offer a festive Late Night Shopping opportunity. CRiC’s community Christmas tree decorating competition will also take place in various venues and St Edmund’s Church is putting on a great programme of children’s activities. More here. Now, where can you take your kids to capture that special ‘magical’ Christmas experience that will be remembered for the rest of the year? Deep inside a mountain lie Wales’ only natural Christmas grottos… Fantastic! The sights and sounds you can experience on your journey are out of this world! Vast colourful, hanging cave formations have all been transformed by the truly stunning Christmas decorations put up by Santa’s elves. The National Showcaves Centre for Wales also has one of the largest collections of life-sized dinosaur models in the world! There will even be a land train waiting to take you down to the Morgan Brothers’ farm to see all the farm animals, and of course their magniﬁcent Shire Horses! Book online here. Step into the Old Railway Line Garden Centre and you will be transported to a magic winter wonderland! They have amazing Christmas displays in store, a farm shop packed with festive delights and tonnes of Christmas decorations! They also have plenty of events to get you into the Christmas spirit…More here. Tradition at Tretower – old and new combine at Christmas for a Fayre and Festivities! Visit our Christmas Fayre at Tretower for some local products from some local sources – and maybe get some inspiration for those last-minute gift ideas too. On Saturday we have the added attraction of the Medieval Household; come and learn how the Vaughan family retainers celebrated the festive season. Holly and ivy, mistletoe and mulled wine, wreaths and Yule logs, and there may be one or two carols as well – old ones, of course! * Admits 2 adults and up to 3 children under 16. More here. On Christmas Eve, the most magical night of the year, the miserly Ebenezer Scrooge is whisked away on a terrifying journey through the past and into the future, accompanied by three fearsome ghosts determined to make him realize the true meaning of Christmas. Charles Dickens’ classic ghost story is brought alive in this most traditional of productions, complete with beautiful period costume, song, dance and a magnificent musical score. Join critically acclaimed theatre company Chapterhouse as Scrooge’s frozen heart begins to melt and he finally embraces the festive spirit in this most Christmassy of Christmas. Tickets here. Be amazed as Father Christmas arrives at Pit Top at 10.30am, travelling 300ft UP from underground on his way to Lapland. Once he’s arrived (and found his elves!) 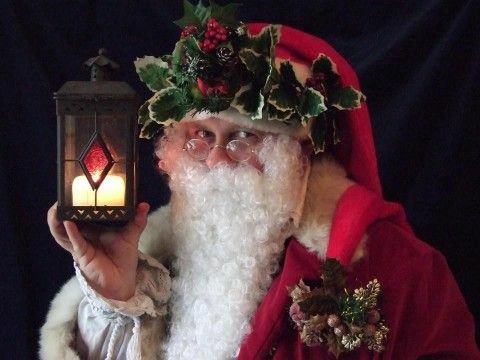 there’ll be an opportu nity to visit him in his cottage, from 11am-1pm and 1.30pm-4pm, and tell him what’s on your Christmas list. Are you in his naughty or good book?Music will also be provided by Blaenavon Town Band. £5 charge to include a gift. Suitable for all children. No booking necessary. Supported by players of the People’s Postcode Lottery. More here. If you are wanting an alternative Christmas or birthday present for an animal lover that also helps a good cause, look no further! Our Dinky Donkey Experience is a wonderful couple of hours with a pair of Miniature Mediterranean Donkeys. Walk the two Dinkies through scenic farmland in the Brecon Beacons while they carry your picnic. Donkey-lovers will adore these sweet-natured little Jacks who love a hug and a fuss. – they are a genuinely small breed from Sardinia that are gaining popularity in the UK but are relatively scarce to date. As all our experiences are within very small groups, they are best for anyone that would like high engagement, interaction and learning about care and welfare of these lovely little animals. As with all Good Day Out experience days, a good cause will benefit, and in this case a donation will be made to Brecon Mountain Rescue for every voucher sold. Get your voucher here! Make Magical Memories this Christmas in our enchanting winter wonderland at Cantref! Our Christmas Experience is even bigger and better than last year. Walk through our Elves Kingdom with real animal nativity scenes and lots of Christmas Trees and Snow. Make reindeer food, sit in Santa’s Sleigh, write your Christmas Letter, play our snowball game and do Christmas crafts while you wait to see Santa in his Grotto. Santa will then give you a special key to enter the magical toy shop where you can select your own gift! The excitement doesn’t end there, we also have Elf Academy where you can learn to be a Christmas Elf, our Mr Ev’s Christmas Show and Christmas Party Games with the entertainment team. Combined with our usual shows such as bottle feeding, pet handling and pony rides along with lots of indoor and outdoor play there is plenty to keep you entertained for the whole day! Our heated indoor soft play area is lovely and warm and our cafe will be serving lots of delicious food and tasty homemade cakes. Tickets are selling fast so don’t miss out oall the fun! Book. Find out what else you can do to celebrate Christmas here! This entry was posted in Uncategorized and tagged Brecon Beacons National Park, Christmas, Christmas shopping Brecon Beacons, Crickhowell. Bookmark the permalink.